I just finished making a crocheted pillow cover and I'm really happy with it! This pillow cover is my own design, and I wasn't quite sure how it would turn out but I think it's pretty good for my first try. I have made fabric pillow covers before and I used the same basic techniques here, only with crocheted pieces. The cover is made with Stylecraft Special DK acrylic yarn, my personal favorite acrylic these days, and a 4.00 mm hook (I use Susan Bates Silvalume hooks). 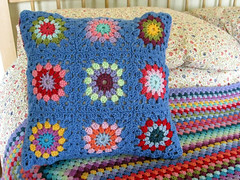 I used leftover balls of Stylecraft in the same colors that I used for my giant granny square; since this pillow is to be used on our bed, I wanted to work with the same color palette. The main color in the pillow's front is Aster, with bits of all the colors in the "Lucy Pack" assortment from Deramores, plus Teal because I love it. I made the front first, creating nine "circle-in-a-square" granny squares. For these squares, I used Solveig's tutorial, found on her blog, Sols(tr)ikke. I love this pattern. It's very well-written and easy to follow. I made one modification to her pattern - I added an additional round to each square to make it a little larger. Solveig simplifies the pattern and I'm looking forward to eventually trying a "flowers in the snow" blanket with these squares; I think it would be a perfect addition to my little lady's bedroom. Solveig offers instructions for joining-as-you go, but I didn't think mine looked right. So I sewed mine together instead, and I like the "window-pane" effect it gave them. For the pillow's back, I made two pieces in Lucy (Attic 24)'s granny stripe pattern, using the same yarns again. I wanted the backing to be colorful and kind of crazy. The pillow insert is 14 by 14 inches square; I made the front piece 15 by 15, to give a little extra room. The back pieces are two different sizes, so that they can overlap. The bottom piece is 9 by 15 and the top one is 7 by 15. This way, there's about an inch to overlap. I made the upper piece with a solid edging; I did an extra row of granny clusters, followed by a row of double crochet stitches straight across. Then I slip-stitched straight across in each DC, creating two button-loops as I went, about equally-spaced across the row. These were made with six chains each. I sandwiched the three crocheted pieces, right sides together (my right side is everybody's else's "wrong" side; I just like it better). Then I sewed them together with Aster and a yarn needle, catching only the outer part of each stitch to create a nice, neat edging. At the sides, where all three pieces were layered to create the opening on the back, I sewed back and forth several times to reinforce the seam. This is how it looked sewn, but still inside-out. I turned it right-side out and put the pillow inside, to be sure it worked. The pillow is a simple 14-inch square covered in unbleached muslin. I bought it on Etsy, from a very sweet lady named Nancy, whose shop, Fine Linen and Scarlett, has every kind of pillow insert you could ever want, at great prices. She ships fast and she's very nice to work with. I bought a few pillows from her because her prices were excellent, even with shipping. It's really fun to try to translate what I know from sewing into a whole new medium. The back cover pieces overlapped by about an inch, just like I wanted them to. And the cover fit the pillow nice and snugly. I was glad I followed my instinct about creating room allowance; I know crochet can stretch quite a bit and I didn't want the cover to be baggy. Now it was time to think about the buttons. I wanted fairly big ones, to make a sturdy closure; I think the ones I chose are half an inch in diameter. I sewed them on with a needle and thread, with the pillow inside. This helped me be sure they were going in the right place. I find it a bit difficult to sew onto something crocheted, but I just make lots of stitches and that generally does the trick. Nice and snug. It worked just the way I wanted it to. The seams looked pretty good too; I was glad I'd sewn into the outer loops of my crochet stitches because the seams came out neat and tidy. I was ready to try it out on our bed. 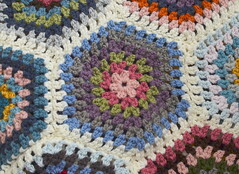 It looked good, pulling together the duvet set and my Giant Granny afghan. I'm so proud of the way our bed looks today; we waited a long time - ten whole years of marriage - to have a really nice bed that is a true piece of furniture, not just the cheap frame they throw in when you buy a mattress. Now I'm all about prettifying the new bed and giving it homespun, handmade charm. This pillow is just what I've been after, even if a certain jokester around here now refers to the bed as the "crochet museum." Whatever, I know he loves it too. I'm proud of my pillow and happy with the way it turned out. I'm already thinking about the next one; I think I'll use a rectangular insert I ordered from Nancy, measuring 12 by 14 inches. I'm not sure of the pattern yet, but I'm thinking ripple. I love having a pretty bed and I am so glad to be developing the skills to make things like this myself. I'm so happy to walk past my bedroom and see these colorful items I've made. One's bedroom should be a homey, cozy haven, I think. I love that ours is taking shape this way and that I'm able to do it myself. I love it too! You have done so well and your bedroom is already looking beautiful. My husband teases me too but guess who wanted a ripple blanket in West Ham colours! Absolutely gorgeous. You should be proud of it. Very pretty! You did such a great job on that pillow! A big pat on the back for you Jennifer! That looks fantastic...and made with love, the most important ingredient! 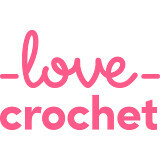 Isn't crocheting just the greatest thing!!!.....EVER!!!! It's so pretty...you are very talented! I love it and the colors are so bright and happy! That pillow is so bright and cheerful! It looks great on your bed, and is the perfect "fit" with your blanket. Lovely! Hi There,Beautiful!! !You can be proud!! !And it really matches nicely with your blanket!! !Thanks for sharing the making of your pillow with us!!! I really love the colours in this. They are so pretty and the back is gorgeous and colourful too. No wonder you're so proud of it!! WOW for a first try. It's pretty and a wonderful keepsake gift! Beautiful! You have great crocheting skills. Honestly I hope I can reach your level of skill someday. What a gorgeous cushion! It looks great on your bed. Thanks so much for following me! This blanket is amazing! I can't imagine how much time it took! That cushion is so lush! Love it! I just spotted this beauty in your side bar. I absolutely love how you made the back. I tend to do the join on the edge but, without lots of buttons, they tend to "gape". Your way looks much neater.